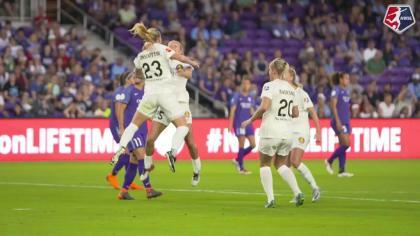 In their first-ever meeting, Utah Royals FC and Seattle Reign FC played to a scoreless draw at Rio Tinto Stadium in Sandy, Utah on Wednesday night. The game marked a reunion between head coaches Laura Harvey and Vlatko Andonovski. Harvey, now leading the way for Utah formerly coached the Reign for five seasons and Andonovski, head coach for the Reign, used to be the head coach for FC Kansas City for five seasons. Week 14 also saw Christen Press make her debut for Utah. Press joined the new franchise after a three-team trade sent Press and former Chicago Red Stars defender Samantha Johnson to Utah. Press earned the start on the night and recorded five shots with three on goal. Johnson was available on the bench, however wasn’t used as a substitute. Utah sits at sixth place in the league standings with 18 points and a 4-3-6 overall record, while the Reign cling on to third place in the standings with 20 points and a 5-3-5 overall record. The home team got things rolling early thanks to midfielder Diana Matheson. Matheson, who has two goals and one assist on the season got herself in a dangerous position at the top of the box and took a one-time shot that rocketed off the crossbar. Reign goalkeeper Michelle Betos got a hold on it to keep the game level. Just two minutes later Matheson took another ripper from outside the box, yet this time her shot went over the crossbar. Press was a threat offensively as the first half progressed and saw her best chance in the 20th minute when Matheson combined with her a the top of the box. Press received the ball from Matheson with her back towards the goal, turned and got a shot off. Press’ shot was saved by Betos, who made a diving stop to the far left post. Betos came up big for her side in the first 45, recording three saves. Seattle’s best offensive chance in the first half came in the 35th minute rom forward Jodie Taylor. Taylor attempted to volley it one-time after Reign midfielder Rumi Utsugi’s shot was poorly cleared by Utah’s backline. Taylor’s shot was collected by Utah goalkeeper Abby Smith. At the end of the first half the Reign held the better of the possession at 54% to Utah’s 46%. Utah however took eight shots in the first 45 to the Reign’s three. The second half unfolded similar to the first half with good defensive work all around. For Utah, defender Becky Sauerbrunn led the way with five clearances, two tackles and one interception on the night. For the Reign, Megan Oyster came up big for she making six interceptions. Betos finished the game with six saves and Smith had three. Offensively neither side could find the back of the net, however Press continued to make her debut one to remember making a dangerous run and cross in the 65th minute. Time continued to tick away, but neither side was ready to settle for a draw. Reign FC almost got the go-ahead goal in the 86th minute when Beverly Yanez crossed the ball into the box and forward Jasmyne Spencer made a diving header attempt. The ball rebounded out to Megan Rapinoe, who took a shot that forced Smith to make a save near post. As the 90th minute drew closer, Press turned up the heat and had two great chances late. Press finished the game with seven shots and four on target. Rapinoe took five shots on the night and recorded two on frame. Utah Royals FC will continue their home stretch when they host Sky Blue FC on Saturday. The Reign will return home on Saturday to host Portland Thorns FC. Match ends, Utah Royals 0, Seattle Reign 0. Second Half ends, Utah Royals 0, Seattle Reign 0. 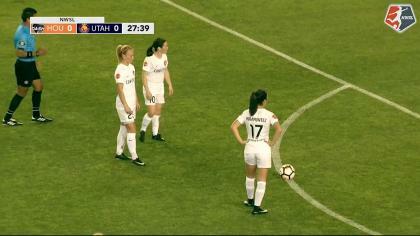 Katrina-Lee Gorry (Utah Royals) wins a free kick in the attacking half. Attempt blocked. Christen Press (Utah Royals) left footed shot from outside the box is blocked. Assisted by Katrina-Lee Gorry. Attempt saved. Christen Press (Utah Royals) left footed shot from a difficult angle on the left is saved in the centre of the goal. Assisted by Erika Tymrak with a through ball. Attempt saved. Christen Press (Utah Royals) left footed shot from the right side of the box is saved in the top right corner. Assisted by Desiree Scott. Attempt saved. Megan Rapinoe (Seattle Reign) right footed shot from the left side of the box is saved in the bottom left corner. Beverly Yanez (Seattle Reign) wins a free kick in the defensive half. Attempt blocked. Becky Sauerbrunn (Utah Royals) right footed shot from outside the box is blocked. Attempt missed. Katie Bowen (Utah Royals) left footed shot from the centre of the box is close, but misses to the left following a corner. Corner, Utah Royals. Conceded by Alyssa Kleiner. Corner, Utah Royals. Conceded by Megan Oyster. Becky Sauerbrunn (Utah Royals) wins a free kick on the right wing. Attempt missed. Erika Tymrak (Utah Royals) right footed shot from outside the box is close, but misses the top right corner. Attempt missed. Megan Rapinoe (Seattle Reign) right footed shot from outside the box misses to the right. Assisted by Alyssa Kleiner. Attempt missed. Katie Stengel (Utah Royals) header from the centre of the box is close, but misses to the right. Assisted by Katrina-Lee Gorry with a cross following a set piece situation. Substitution, Utah Royals. Erika Tymrak replaces Amy Rodriguez. Substitution, Seattle Reign. Beverly Yanez replaces Nahomi Kawasumi. Attempt missed. Christen Press (Utah Royals) right footed shot from outside the box is just a bit too high. Assisted by Rebecca Moros. Offside, Seattle Reign. Michelle Betos tries a through ball, but Megan Rapinoe is caught offside. Attempt saved. Katie Stengel (Utah Royals) header from the centre of the box is saved in the centre of the goal. Assisted by Rebecca Moros with a cross. Attempt missed. Megan Rapinoe (Seattle Reign) right footed shot from more than 35 yards is too high. Attempt saved. Megan Rapinoe (Seattle Reign) left footed shot from outside the box is saved in the centre of the goal. Assisted by Jodie Taylor. Attempt missed. Gunnhildur Yrsa Jonsdottir (Utah Royals) header from the centre of the box misses to the left. Assisted by Katrina-Lee Gorry with a cross following a set piece situation. Stephanie Catley (Seattle Reign) is shown the yellow card for a bad foul. Foul by Stephanie Catley (Seattle Reign). Delay in match Abby Smith (Utah Royals) because of an injury. Foul by Katrina-Lee Gorry (Utah Royals). Second Half begins Utah Royals 0, Seattle Reign 0. Substitution, Seattle Reign. Alyssa Kleiner replaces Morgan Andrews. First Half ends, Utah Royals 0, Seattle Reign 0. Attempt missed. Megan Rapinoe (Seattle Reign) right footed shot from outside the box misses to the right. Assisted by Stephanie Catley. Attempt missed. Christen Press (Utah Royals) left footed shot from outside the box is high and wide to the left. Morgan Andrews (Seattle Reign) wins a free kick in the defensive half. Attempt saved. Amy Rodriguez (Utah Royals) left footed shot from the left side of the box is saved in the bottom left corner. Assisted by Rebecca Moros with a through ball. Attempt missed. Katrina-Lee Gorry (Utah Royals) right footed shot from outside the box is close, but misses the top right corner. Assisted by Amy Rodriguez. Corner, Utah Royals. Conceded by Michelle Betos. Attempt saved. Christen Press (Utah Royals) left footed shot from outside the box is saved in the bottom left corner. Assisted by Diana Matheson. Attempt saved. Christen Press (Utah Royals) right footed shot from outside the box is saved in the bottom left corner. Diana Matheson (Utah Royals) wins a free kick on the right wing. Attempt missed. Rumi Utsugi (Seattle Reign) left footed shot from long range on the left is close, but misses to the right. Attempt missed. Diana Matheson (Utah Royals) right footed shot from outside the box is close, but misses the top right corner. Assisted by Amy Rodriguez. Attempt blocked. Katie Bowen (Utah Royals) right footed shot from outside the box is blocked. Corner, Utah Royals. Conceded by Kristen McNabb. Diana Matheson (Utah Royals) hits the bar with a right footed shot from outside the box. Assisted by Amy Rodriguez.